Luc believes that physical activity is a key component to our overall health and wellness, no different from brushing our teeth or showering on a regular basis. The goal when exercising is to improve our efficiency as human beings and each person requires a different prescription in order to accomplish this. There is no one size fits all program; we all need individualized attention to make the best use of our strengths, improve upon our weaknesses, and cope with the various bumps and bruises we sustain during our accomplishments in life. 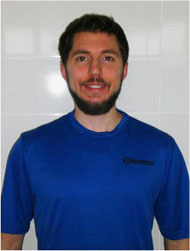 Luc believes that personal training is a means to finding the best and most enjoyable way to achieve your goals and help you to excel in your job, sport, and personal life. It’s not about fad diets or the latest fitness trends but what’s going to work for you as a unique individual. Get ready to be surprised at what you are capable of achieving!